I’ve been using disposable plastic razors for more than 40 years. This year, I decided to put an end to all that thoughtless waste and switch to a mid-range electric shaver. To save you a lot of time and hassle, I’ve drafted this quick guide to the best electric shavers under £100 for men in 2019. I hope that one of the mid-price shavers on my shortlist will encourage you to switch to a more environmentally aware shave! Why switch to an electric shaver now? Let’s face it, whether it’s coffee cups or food packaging, we’ve created a throw-away society. Our beaches are littered with plastic junk, and our seas are polluted with plastic bags, bottles and polystyrene waste. To stop this getting any worse, we all need to change our buying habits. As an average UK household, we’ve decided to cut down on our addiction to convenient, throw-away goods and packaging – including disposable plastic razors! Is a mid-priced electric razor as good as a disposable? Let’s put it this way, the best shave you’re ever going to get is probably from a steady-handed barber with a traditional cut-throat razor. For most of us that’s just not practical. For less than £100, there are a vast range of ‘wet and dry’ cordless shavers on the market that will give you a close, comfortable shave. Many of these are now fully waterproofed, and fitted with long-lasting, Li-ion (Lithium ion) batteries – great as a convenient morning shower shaver! When I decided to make the switch from a disposable razor to an electric shaver, I was bewildered by the range of models on the market. The ‘Which?’ best shaver guide wasn’t much help, as you had to pay to view their top electric shavers. That’s one of the reasons that I decided to post my own Top Ten electric shaver reviews free in this blog. The two market leaders seem to be Braun and Philips. Both of these top electric shaver brands have models ranging from around £30 to £450. As a freelance product copywriter, I don’t earn enough to splash-out on a £450 razor, so my best electric shavers for 2019 are selected from the £40 to £100 rechargeable shaver ranges. Rather than stick to the best selling electric shaver brands, I’ve also investigated models from the classic electric razor manufacturer, Remington. You’ll also find suprisingly good value shavers from China based Phisco, and Idaho hair-clipper trailblazer, J. Frank Wahl. As you read these electric shaver reviews, you’ll find that they all have their pros and cons. What I can promise is that each of the models I’ve selected represents excellent value for money. Wahl have been my go-to hair clipper brand for about 25 years. Though their products can look a little dated, they usually have bullet-proof build quality and solid reliability. Their Wahl Ultima Plus Shaver was the first item added to my wishlist of top-ten shavers. The Ultima Plus is a dry shaver, so it’s not designed for daily use with water or shaving foam, and it’s definitely not recommended for the shower. This low-cost Wahl shaver does have a neat ‘lift and wash’ function that allows you to clean the dual foil heads by holding the razor under a running tap. Though this is a little more clunky than the Philips cleaning system, it gets a messy job done without too much hassle. As well as a dual foil shaving system, the Ultima Plus also has a two-position trimmer for smartening-up sideburns or a moustache. It also comes with a clip-on attachment that will leave a trendy 2mm to 4mm length of manly stubble on your chin. Wahl’s Ultima Plus shaver delivers a close, comfortable dry shave. This model uses lower capacity NiMH batteries, but it can also be used while plugged into a 2 pin bathroom mains socket. Click here for more details and buyer reviews (Amazon). The Braun ProSkin 3040s Wet & Dry Electric Shaver is a great wet & dry model that you can use as a shower shaver. Whilst Braun’s ProSkin series is recommended for sensitive skin, it’s worth remembering that it can take several weeks for your body to adapt from a disposable razor to an electric shaver. 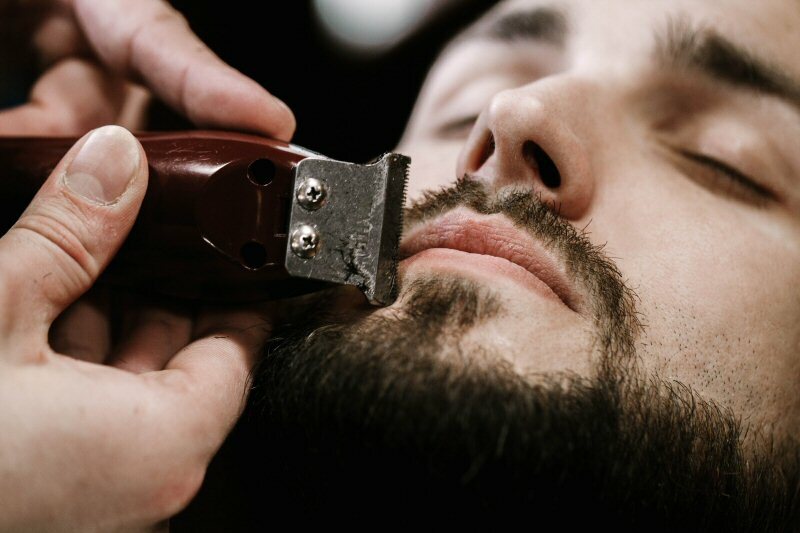 You may also find that you have to spend a few more minutes shaving with an electric razor. With two tilting foil heads and a central micro-comb foil element, the ProSkin 3040s clears a lot of bristle with minimal discomfort. As with most mid-price electric shavers, this model comes with an effective built-in trimmer. Dual NiMH batteries help to keep the price of this high-performance electric shaver lower than it’s Li-ion powered competitors. Don’t miss this opportunity to buy a great value Braun wet & dry electric shaver well below the £100 mark! Click here to check-out more than 2800 Amazon buyer reviews on this product. There are two things that I really like about this Philips Series 3000 Wet & Dry Men’s Electric Shaver . First, is the high-capacity Li-ion battery. This delivers a slightly longer, 50 minute shave-time from a 1 hour charge. Second, is the simple, pop-open shaver head cleaning system. This makes it fast and simple to give the triple rotary heads a deep-clean under running water. When it comes to rotary electric shavers, Philips has built a strong reputation as a market leader. Considering the very affordable price-tag, this Series 3000 Wet & Dry model exceeds expectations. If you’re switching from a disposable razor, you’ll need to spend a little more time going over some of your facial contours. The Philips multi-directional ‘DynamicFlex’ heads certainly help – but be prepared to put in a little more shave-time during the first few weeks. To cut manufacturing costs (and RRP), this Philips Series 3000 electric shaver has a basic, single bar LED battery charge indicator. A pop-up precision trimmer is located behind the triple shaving heads. Click here for product details, low-price, and more than 2000 Amazon buyer reviews for this Philips shower shaver. Still way under the £100 price-point, this Panasonic ES-RF31 Electric Shower Shaver has many of the features that you’d expect to find on a much more expensive model. Fully waterproofed, the ES-RF31 can be used with shaving foam or gel, and is perfect as a rechargeable razor for daily use in the shower. Panasonic is a long established Japanese brand, and this particular model has been on the market for several years. This is probably why you get so many premium shaver features at an incredibly low price! Only around £10 more than the Braun and Philips shavers, the Panasonic ES-RF31 features an ultra-fast, 10,000 rpm motor, along with enhanced blade and foil technology. Unlike other models in this electric shaver review, the ES-RF31 has a replaceable Li-ion battery. This means that the shaver’s life expectancy can be extended way beyond the usual number of charge cycles that you can expect from a built-in rechargeable shaver battery. Panasonic’s ES-RF31 gives a great shave, particularly with an 8mm pivot on the head. Though a full set of replacement blades and foils is quite expensive, it may be worth paying a little extra to keep this quality wet and dry shaver operating at peak performance! Click here to check out the latest Amazon price for this Panasonic shower shaver and trimmer. I couldn’t resist taking a closer look at this classic gentleman’s F7800 Dry Electric Shaver from Remington . This US based brand was big in the 1970’s, and it looks like the company is still capable of producing a top-performing dry shaver with a stylish look and feel. Apart from the LCD shave-time countdown, and pop-up ‘tache-trimmer, this is pretty much a no-frills electric shaver. The dual Titanium coated foils and central comb deliver a close electric shave – it’s a style that seems to be particularly popular with more mature buyers. Click here to view this stylish gentleman’s grooming accessory on Amazon. With a shave performance that matches Remington’s dry shaver, how about this shower friendly Remington PF7600 Waterproof Shower Shaver ? Remington’s fully waterproof PF7600 ‘Comfort Series’ electric shaver can be used in the shower with your favourite foam, gel or other pampering products. A high-capacity Li-ion battery helps this capable shaver to deal with the meanest stubble. Expect around 60 minutes of shave-time from each two-hour charge. To cut the RRP to way less than £100, Remington has replaced the fancy LCD timer of the dry-shave model with a no-frills LED battery level bar. No fancy gizmos on this value for money shower shaver – just the usual, pop-up sideburn trimmer. This surprisingly good shower shaver is well worth a closer look! Click here for the latest Amazon price reduction. Currently retailing at less than £50, this Phisco Rotary Waterproof USB Shaver is clearly a low-price Chinese re-make of a contemporary Philips rotary shaver. What sets this Phisco shaver apart from the other models in my electric razor review is its USB charging capability. Coming with a standard ‘Android’ style phone cable, this shaver can be recharged from a PC/Laptop USB port, or fast-charged from a USB mains adapter (not included). This Chinese Li-ion shower shaver not only looks good, a 2,800 rpm motor and double blade, floating head system also ensures that you get a clean, comfortable shave. Out of all the waterproof shavers listed in this post, this cheap Phisco model was the one that I finally bought. It runs for ages between battery charges, then recharges superfast from my Android smartphone 2A wallchager. I’ve now been using this model for about a year – it still looks like new and delivers an incredibly close wet shave. Click here to view the latest Amazon price for this value for money waterproof shaver. If you’d like to give this low-cost, high-spec shower shaver a try, there’s no need to be concerned about finding replacement parts. The Phisco rotary shaver uses low-price PH-BC09 replacement rotary heads. Just click this link to order replacement Phisco PH-BC09 shaver heads from Amazon . This sleek Braun WaterFlex WF2s Red Electric Shower Shaver is all you need for a no-frills wet or dry shave before work. Featuring dual Braun OptiBlade foils which are specially designed to cut long and short facial hair, the WF2s offers a close, high-comfort shave. The shaver also has an easily deployed trimmer for stray hairs and sideburns. As well as giving the shaver a distinctive, dynamic look, the Red non-slip sleeving also helps you to grip the shaver if you are using foam or gel in the shower. The Braun WaterFlex WF2s Shaver comes with a two-pin, bathroom style plug and extending lead for charging. A built-in Li-ion battery is capable of powering around 45 minutes of shave-time after a 1-hour charge. Li-ion batteries are much less prone to the gradual decline in performance that you experience with other types of rechargeable cell. Click here to check out the latest Amazon price for this distinctive Red shower shaver from Braun. This Red version of the WaterFlex WF2s electric shaver is currently on offer at a much lower price than the Blue model . This Philips AquaTouch Plus AT890/16 Rotary Shower Shaver is close to the upper limit of my budget. Is the extra £20 to £30 outlay worth it for a smoother, lighter touch? This model does seem to be a hit with loyal Philips rotary head razor fans. Though the AT890/16 doesn’t get rave reviews as a dry shaver, it does get a lot of praise from sensitive-skinned wet shavers. This is probably due to a combination of smoothing lubrication, and the Philips dual-blade, floating head system. Unfortunately, it’s those floating heads that put me off this smooth-running shower shaver. Replacement heads are pretty expensive, but you can find them at a lower price if you shop around on eBay etc. If you don’t mind paying a little extra for replacement heads every 18 months, this is a great buy for anyone with sensitive skin. Just take it easy for the first few weeks while you make the switch from your disposable plastic razor to your swish AquaTouch Plus! Click here to get the latest price, specifications and reviews (Amazon). If you’re the kind of guy that can grow a full beard in a day, why not work with nature and order this Braun 3010BT Wet & Dry Beard Grooming Shaver ? As well as being a fully functional shower shaver, this grooming package includes a full set of clipper style combs to tame a backwoods beard. The engine powering this beard tamer is Braun’s standard, Series 3 motor with a built-in NiMH battery pack. Whilst this is more than adequate for a daily shower-shave, serious beard trimming is likely to put a little more strain on battery capacity. Even without the accessories, this is still a top mid-price razor. The colourful, non-slip grip on the 3010BT shaver makes this model particularly easy to handle in the shower. If you’ve gone all-the-way and adopted a fully shaved head, this multi-purpose shower shaver could transform your regular shaving routine! Click here to check out the latest Amazon price for this Braun shower shaver and beard grooming package. Thanks for reading my electric razor reviews and recommendations – more top quality product reviews coming soon!